The Geneva Internet Conference (GIC) addressed critical issues, gaps, and future developments in Internet governance (IG) and digital politics. The conference provided a neutral and inclusive space for debates as it paves the way to 2015, building on the main events and developments in 2014, including announcement of the transition of the IANA oversight of Internet functions, NETmundial and the Internet Governance Forum. Check the Programme tab for sessions' recordings and notes. How to ensure genuine and robust IG processes? How to promote the proper participation of various actors in IG? How to overcome policy silos? How to make decisions and generate concrete outputs in IG multistakeholder processes? How to ensure effective implementation and compliance in IG? 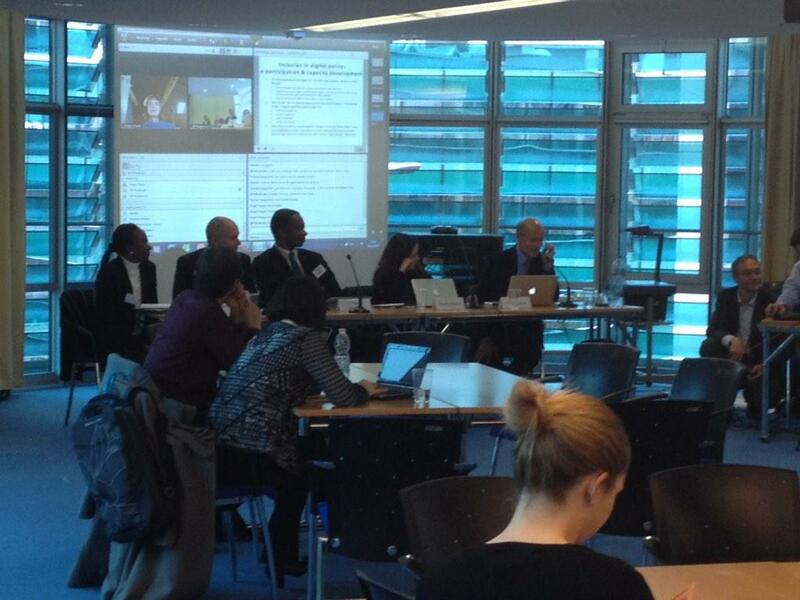 The Geneva Internet Conference (17-19 November, 2014) was organised as a process with a number of preparatory and follow-up activities. Users and communities worldwide participated in interactive sessions via e-participation and remote hubs. Before the conference, substantive discussions focused on key themes to inform the design of the conference and to facilitate dialogue between the IG and other policy communities (security, migration, climate change, etc.). Each theme was introduced in an hour-long webinar with open participation, followed by three-week long online discussions, whose outcomes fed into the conference. # 1: How to overcome IG policy silos on global and national levels? Policymakers across different sectors face similar issues, yet follow or adopt very different perspectives. A cross-cutting approach is more the exception than the rule in organisations and institutions dealing with Internet-related topics. What can be done to achieve coordination among different actors on the national and international levels? How can we avoid turf battles and foster constructive dialogue? To what extent is it possible to overcome policy silos? What practical approaches can be used to create IG policy coherence - examples, case studies, anecdotes? [Update] The webinar to introduce this first theme was held on 16 September. The webinar recording and digest are now available here. [Update] A survey on policy silos was conducted. Its purpose was to study how organisations and departments deal with cross-cutting Internet policy issues such as human rights and security. View the survey questions here. # 2: Whom do I contact if I want to raise my Internet governance (IG) concern? IG is a highly complex policy space with hundreds of actors addressing more than 50 different policy issues in a wide range of forums. Few actors, if any, have a complete grasp of its full complexity. This challenge has triggered many small and developing countries to request a one-stop shop for voicing their concerns. The design of this one-stop shop, or clearinghouse, is key: Should it be a new international Internet organisation, a global multistakeholder IG clearing house, a distributed governance system, or...? What other properties/functions should it have? What are the particular needs of your organisation/institution? Which of the models should it follow? [Update] The webinar to introduce this second theme was held on 6 October. The webinar recording and digest are now available here. # 3: Evidence and measurement in IG: What sort of data and numbers are we talking about? Paradoxically, although the Internet is an engineering artefact, we have very little data relevant for IG. In cybersecurity, we are still in doubt about the number of threats and the size of the losses incurred. The same applies in other IG fields. Without understanding the scope of the problem, it is difficult to discuss possible solutions. What can be done to bring more evidence in IG, using what concrete tools and techniques? How should an IG observatory, which would gather and prepare such evidence, function? [Update] The webinar to introduce this third theme was held on 28 October. The webinar recording and digest are now available here. Preserving one Internet involves different policy processes. More than 50% of global Internet policy is discussed and decided on in Geneva: telecom infrastructure, human rights, e-commerce, digital intellectual property are just a few of the areas. This high-level panel will discuss different policy angles, and ways in which cross-cutting Internet policy can be developed. High officials from the ITU, the WTO, and WIPO will discuss potential synergies among their activities of the relevance for the Internet. What does Internet governance include? What are the criteria for mapping Internet governance issues and their relevance? How can we create easier access to Internet governance? If a one-stop shop is a solution, what functions should it have and how should it be organised? The omnipresence of the Internet in modern society makes most Internet policy issues transversal. For example, cybercrime cannot be addressed only as a security issue or e-commerce only as trade issue. Yet, a transversal approach is more an exception than a common practice in Internet governance. This session will discuss ways and means of introducing a transversal approach using the example of data protection and privacy, addressed from standardisation, human rights, diplomatic, security, and business perspectives. The Internet does not function in a legal vacuum. Increasingly, it is perceived that what is (il)legal offline is (il)legal online. The UN Human Rights Council made this principle explicit: ‘The same rights that people have offline must also be protected online.’ Thus, most Internet issues are already regulated in the offline environment (e.g. jurisdiction, copyright, trademark, labour law).The main challenge is how to apply these rules to Internet transactions, particularly in view of transborder aspects and the speed of Internet activities. At the preparatory seminar for the Conference, the idea of legal innovation with wisdom was suggested. It means that there is a need for innovation for the Internet, which should not ignore the wisdom of the legal profession gathered over centuries in regulating conflicts and ensuring order in human society. Is there any area where the ‘offline/online principle’ cannot be applied and there will be a need for new substantive rules for the Internet? What are the specific challenges for applying existing legal rules on the Internet? How do we innovate with wisdom? What are the possible innovations? Inclusive digital policy depends on e-participation and capacity development. E-participation ensures participation of all those who cannot participate in situ. It is not surprising that e-participation in global governance is most advanced in the field of Internet governance. The session will discuss the four most relevant experiences in digital policy: the IGF, ICANN, the ITU, and NETmundial. What practical techniques are there for making e-participation more effective? How can we ensure proper synchronisation between two dynamics of the event: in situ (in the conference room) and remote (via e-participation)? How do we deal with different time-zones in e-participation? How do we ensure capacity development for e-participation? With more than 50 Internet policy issues addressed in hundreds of various forums, many actors face difficulties in following Internet governance. Some governments, such as China, the USA, and Germany, have introduced cyber and Internet ambassadors as a way of covering foreign digital policy. Many countries started a national Internet Governance Forum in order to integrate the wider technical, academic, and business communities in Internet policies. For business and technical communities, following IG requires covering non-technical issues such as human rights (e.g. privacy). For civil society, in particular small organisations, covering the IG field is becoming very difficult. At the same time, due to the inter-connection of IG issues, many actors cannot afford not to use a comprehensive approach including technical, legal, and human rights aspects among others. Panellists will present different experiences in covering Internet governance and suggest some practical solutions. The session is planned to end with a list of concrete suggestions that should help various actors to deal with the complexity of IG. Transparency is essential for robust and effective Internet governance. It is particularly important in multistakeholder spaces that typically do not have procedural mechanisms to ensure procedural transparency and due process. While full transparency should be a default operational mode, in some cases a ‘translucent’ approach could be considered (e.g. limited public participation in deliberation with full publicity of results of deliberations). This session will aim to establish criteria for determining the level of transparency needed (e.g. full transparency with transcription, access to documents, etc.). It will rely on experiences from the Open Governance Partnership and ILO communities. While global solutions are preferable for global issues (e.g. IG, climate change), they are often difficult to achieve. After the failure of the Copenhagen summit (2009), the climate change community focused more on local, national, and regional initiatives. The same tendencies are noticeable in IG (most cybercrime conventions are regional, protests against IG policies are regional/national – SOPA, ACTA). IG issues should be addressed at the policy level which is closest to the cause of the issues (e.g. cybercrime) or the impact a specific policy may have (e.g. access, net neutrality). The main challenges will be to ensure that ‘policy elevators’ move both ways (up and down) among local,national, regional, and global levels. The session will also discuss the practice of ‘forum shopping’ (inserting policy initiatives on the most favourable policy level). Swiss academics and practitioners will present the country’s long experience in using subsidiarity principles. What issues could be addressed effectively at a lower level than a global one (e.g. regional and national levels)? How can we ensure synchronisation among different policy levels while avoiding the risk of ‘forum shopping’? Survey of data and measurement for specific issues. Techniques and approaches to improve evidence and measurement of relevance for IG. Background: Cognitive technologies: mapping the Internet governance debate by Goran S. Milovanović provides a simple explanation of what cognitive technologies are and presents an example of applied cognitive science (text‑mining) in the mapping of the Internet governance debate. The different stakeholder communities remain divided over the legitimate carrying out and enforcement of decisions. Consequently, compliance remains a test case for IG processes. How can we ensure effective implementation and compliance of decisions, in particular those that require the participation of multiple actors with different views on legitimacy and accountability? Why did you see a need to adopt a multistakeholder approach? What challenges were you facing and how did the multistakeholder approach address them? What were the three main lessons learned and take-aways from the process, and what would you do differently? One of the fathers of the Internet Jon Postel said ‘Group discussion is very valuable; group drafting is less productive.’ The more people involved, the greater the complexity of the process. The drafting process is not individual writing; it is highly social. Thus, ‘socialisation of the text’ is essential for successful negotiations. All involved should be aware of how the final draft was negotiated, what was included, and what was left out. Participants should know that their voices were heard, considered, and adopted… or not, accordingly. How do we harvest and harness a wide range of inputs in the drafting process? What types of procedures are needed to ensure that the drafted text can have legitimate acceptance by most actors involved in the process? How do we deal with conflicting situations in the drafting process? Funding, accountability, and trust are closely inter-related and are necessary for a legitimate governance system. Funding contributes to accountability, which in turn creates more trust in IG space. This session will address various approaches to fundraising in Internet governance. It will also discuss the question of accountability and trust. Please check the Programme for session recordings and notes. Please review the conference build-up tab, to review the build-up and all pre-conference activities. These discussions formed the foundation for sessions during the conference. WebEx was used as a platform to facilitate remote participation, and a webcast was provided. Remote moderators in each session assisted remote participants who wanted to intervene when interventions, either in situ or online, were invited by the panel moderators. The remote platform page with the platform chat was projected on a screen in the conference rooms. Remote participants were invited to post written interventions/comments, to be read into the meeting by the remote moderator. The GIC emphasises the role of the remote moderator as an advocate for each remote participant so that comments or interventions will be included when comments from the audience are invited. Chat comments are not considered to be interventions, but are a normal part of ongoing discussion between participants, as happens between in situ participants in the audience or in corridors. This is an important part of conference interactions, and for this reason will be projected in the conference rooms. Comments that are meant to be included as oral interventions should be indicated as such in a specific request to the remote moderator. However, the WebEx remote participation screen was projected on a screen in the conference room, and were visible to in situ attendees. In the photo on the right, and the WebEx projection shows a remote panelest speaking (upper left quadrant of the screen), the session slide, the participant list, and the chat screen in the other quadrants. Twitter gives us the opportunity to interact with each other, and with those who cannot attend in situ or remotely. According to Topsy.com, the #IGeneva hashtag had 1 727 tweets from 17 November to 24 November (with over 100 photos). The Storify collection below shows tweets from or about remote participation at the GIC. Storify collections of the conference proceedings as a whole are available on the main GIC webpage. The following remote hubs were registered for the GIC. *Note: the Chicago hub was a virtual hub, meeting online, not in situ.